This baked cod recipe carries the flavors of the Mediterranean. It calls for either cod or haddock. Either fish would be perfect because the fillets are not too thin and both fish are mild tasting. Rinse the fish fillets and pat them dry. Lay the fillets flat in a baking dish. Squeeze the juice of one lemon over the fillets. Sprinkle with sea salt. In a skillet, saute the onion with butter or olive oil until tender and softened, but not browned. Combine the onion, tomatoes, rosemary and juice from the remaining lemon half. Spoon this mixture over the fish filets. Bake for 4 to 6 minutes per 1/2 inch (1 cm) thickness of fish, until the fish is opaque. Remove from the oven and let sit for 5 minutes before serving. Garnish the dish with black olives if you desire. Serve over boiled potatoes or rice. This recipe for baked cod fish is already super healthy, with the inclusion of lemon, rosemary and vegetables. That said, the recipe says to use either butter or oil. I think this recipe is tasty, healthier and more authentic if you use olive oil, so I would use that. This is a perfect diabetic recipe, with healthy fats, fish and vegetables. 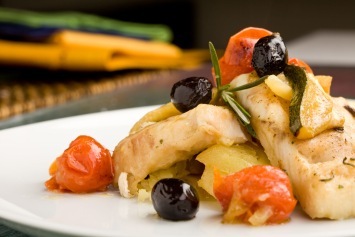 This baked cod recipe is just one of our wonderful collection of fish recipes.